This last weekend I installed a couple sparco R100 tuner seats in my '07 hatchback. We relocated the factory seat belt buckles and respective wiring to the sparco seats and reconnected the wire harnesses, with the exception of the air bag modules (obviously). We expected to see the amber 'airbag off' light to the right of the AC vent, as well as the red airbag light on the dash cluster itself. What we didn't expect to see is a red flashing seat belt light on the same panel to the right of the AC vent where the airbag on/off lights are. Any idea why that light might be flashing? The passenger seat belt buckle had two wire harnesses for what we believed to be the seat belt and airbag. The driver seat had a third harness (no idea what for). Both seat belts buckle and there is no beeping. Unbuckling the driver seat belt produces a red seat belt light on the dash cluster, as normal. Buckling the driver seat belt makes that light go away, so I'm sure the flashing seat belt light on the right side in the air bag on/off light area is related to the passenger seat belt. Buckling the passenger seat belt doesn't make the light disappear. We tested coming to a hard stop and both seat belts still lock-up under hard braking. Everything appears to be normal, so we couldn't understand why the blinking seat belt light appeared. The only thing we didn't reconnect on the passenger seat was the airbag wire harness. Any help while I'm searching the forum/internet on my own would be greatly appreciated. It sounds like the occupant detection system is unhappy. The passenger seat has a sensor that detects a person, then it will turn on the airbag. ODS and the SRS system are tied together basically. So it sounds like because I have to disconnect the airbag wiring harness, the seat belt light is going to flash along with it, right? Or delete the entire wiring system and airbags... you dont need that sort of negativity in your life..
That was exactly the point I made to my better half since she had concerns about losing the passenger airbag. In any car, the airbag is not a guarantee. There are so many variables that in many cases, airbags have caused more harm than good. If I can keep it working with aftermarket seats, I would. If not, I'm not crying about it. We usually take her car when together anyway. My car has become my biggest toy lol. 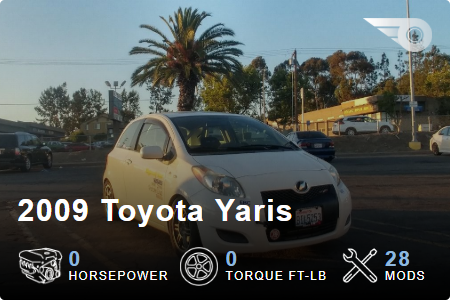 Side note - You still posting the Wheelwell banner into your YW sig despite it saying 0 HP and 0 Torque is hysterical. That's the thing too even in a stock set with harness and air bag the harness won't allow the sest to absorb the impact. Your body becomes the weakest link..
And yes. Gotta show pride. Updating this thread for anyone that might find it in a search one day. Forum super user and all around awesome guy CTScott makes a bypass module that will emulate the passenger seat weight sensors. It even comes with a switch to turn the airbag on/off that can be installed in a dead panel. Link to it at a third-party distributor here, for reference. It's in the mail and on its way to me. I'll update again once installed. If you remove the passengers seat from the car you'll get an SRS aka airbag light on the dash since the computer will sense the open circuit from the missing passenger seat connector. The car will drive perfectly fine, with no beeping just with the dash light on. You will not only get the airbag light on the dash cluster, but you will also get the 'airbag off' light in the area to the right of the AC vent, and the seat belt light will flash (even if you reconnect the seat belt harness). It appears the airbag and seat belt modules go hand-in-hand in these cars. There are two wiring harnesses under the passenger seat. Disconnecting one or both produces the three lights mentioned above. If you remove the passenger seat altogether, everything will work except for the passenger side airbag and you will have three flashing lights. Installing a bypass module like the one I'm getting from CTScott will make the lights go away and give you a switch for enabling and disabling the airbag and seat belt sensors. I received the Occupant Detection Sensor Bypass Module from CTScott and installed it last night. Works exactly as intended. When I flip the switch to off, all lights in the passenger airbag/seat belt panel go off. When I flip the switch to on, the passenger 'airbag on' light comes on and the passenger seat belt light starts flashing if not buckled. I'm going to have my audio guy do me the favor of drilling one of the dead panels down by the parking brake and AUX jack area for a super clean install of the airbag on/off switch. With the switch located there, either driver or passenger will be able to enable or disable the passenger airbag with the press of a button. Super slick. It'll look factory and work even better. It tickles me a bit to think that guys that own local shops around here with swapped seats in their cars are rolling around with airbag lights on their dashes and thanks to the mighty CTScott, I won't have to. I do still have one airbag light on the dash cluster itself, which as detailed in the instructions that came with the bypass module, is due to the SRS system having reported an issue and logged a fault code or three, which don't clear on their own. CTScott includes detailed instructions on how to use a jumper on the OBD port to clear those codes and get rid of that light, I just need to sit down and do it. Since it's a bit fiddly, I might see if my contact at the local Toyota dealership can clear the code for me using Techstream so I don't have to mess with a jumper on the OBD port myself. Sounds like you have a great setup! She's supportive of anything I want to do, but her biggest issue with them was the loss of the passenger airbag. Now that I have that issue sorted, she feels better about them but being 5' 1", they don't fit her as well as they fit the average sized guy, so she still prefers the factory seats over the Sparcos. She's the type to always prefer stock options to aftermarket, so it's not surprising to me. Fortunately for her, we usually take her car when we go places, unless it's a car related event. What is your wife's biggest issue with swapping seats? The way they look? The investment? Fear of messing with the airbag system? Quick update - tried doing the jumper technique on the OBD port to clear the registered codes and wasn't getting anywhere. It was then that I realized there was one wiring harness on the driver side that we did not reconnect because it was connected to a module on the factory driver seat that was screwed in with a star headed screw. Not sure what that module is, but I'm sure if it's not connected, the system will throw a light. Picked up some star headed screw drivers and plan to take the module off the factory driver seat and reconnect to the harness coming up from the floor on the driver's side. If the SRS light doesn't immediately go away after that, I'll try the jumper technique again in hope of the clearing the code. I should be in the home stretch of having all dash lights and restraint systems back to factory spec. Even better now that I'll have a switch to enable and disable the passenger airbag at will. Relocated the final sensor from the driver seat, which interestingly, had not only a star head screw holding it on, but it also had a strong magnet inside that grabbed and slid along the seat rail itself. I've never seen that before. My only assumption, which I doubt is correct, is that the magnet can tell how close/far the driver seat is from the airbag which would impact how much the bag inflates on impact? I sit as far back as possible anyway, so I plugged it back into the harness and stuck the sensor to the underside, rear inner corner of the sparco bracket. The magnet held it on very tightly. After reconnecting the battery and firing her up, I have no SRS lights on the dash! The last step is to have my local audio guy do a pro install of the switch on one of the dead panels down by the AUX jack so I can conveniently turn the passenger airbag on and off as needed. I couldn't be more stoked and have to again thank CTScott for the bypass module. With that, the end result of this seat swap has been far cooler than I originally expected. I bought my Yaris a month ago, and it had the seat belt light flashing and air bag light on. I got price knocked down thinking maybe just a sensor needed replacement. I found this forum and checked under driver's seat looking for a loose connector and found one unplugged. Plugged it back and no more warning lights! My car only had one owner before, and maybe they unplugged it? But used car dealer I got car from had no idea how to fix it. Also was able to also saved a $178 diagnostic fee from Toyota dealer to see what was going on.